The label or numbers on the dial appear to be paper. It has the words Sessions Clock Co, Forestville Conn. Size: 18" long X 4.5" deep X 10" tall. It is a wooden case with no marking or label on the case. 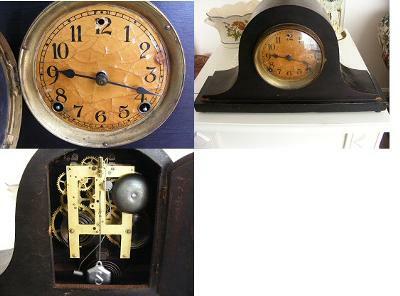 It is an 8 day clock that "dings" on the 1/2 hour and chimes on the hour. It runs just fine. I received this from my Father after he died. He had it setting in his bedroom, but he never "wound" it or used it. I assumed it did not work. I was surprised when I "cranked" it up that it worked great. Any help with date(s) and value would be appreciated.